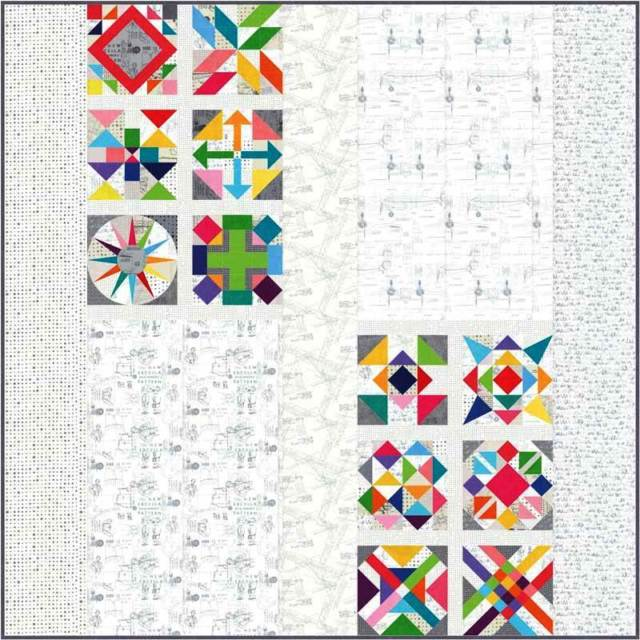 Modern quilts are very popular and Zen Chic has designed a wonderful quilting project with inspiring blocks. The instructor will guide you on tips and techniques to complete the pieced and foundation paper piecing blocks, along with hints on finishing the quilt top. The quilt as shown on the pattern makes an 85”x 85” bed quilt. However you can make a smaller sized quilt or individual blocks for framing, table runners or pillows. Students will cut and sew blocks in each class, however all blocks will not be sewn in class and homework will be required to complete the quilt top. Spotted More Paper Pattern - please make an additional copy of each of the foundation paper pieced block patterns (Blocks 5, 8, 10 and 11). Fabric Options: 1) Purchase the kit from Roberts that includes all the original Zen Chic fabrics from the Spotted and More Paper lines by Moda (the kit includes all the fabrics to make the 85" x 85" quilt, including binding). Backing fabric is not included -or- 2) purchase 1/4 yard of 7 colored blender fabrics and 1/8 yard of 14 different blenders for a total of 21 different colors (e.g. : solids, marbles or other blenders). For the block backgrounds you will need 1/8 to 1/4 yard of about 19 different low volume and darker prints (e.g. : solids, Grunge, marbles or other low volume small scale prints). Also needed for the 85" x 85" quilt is 3/4 yard of 6 low volume prints for the background and 3/4 yard for binding (a total of 4-1/2 yards of background fabric is needed). Note: if not purchasing the kit from Roberts, you want to choose fabrics that are clear in color and contrast well. Rotary Cutter and Cutting Mat. 6" x 12" Ruler. Triangle Ruler (e.g. : Fast2Cut Essential Triangle Tool by Bonnie Hunter -or- Fons and Porter Half and Quarter Square Ruler). 6" BlocLoc ruler for trimming triangles. Mary Ellen's Best Press or Fabric Starch. For Foundation piecing blocks-a small wooden iron or a small electric iron. Add A Quarter Ruler (preferably 12"). Straight edge and fabric glue. Triangle Templates will be provided by the instructor. Neutral Thread for piecing and bobbin (recommend 50 wt. Aurafil cotton thread). Sewing machine (in good working order) with foot control, electric cord, and 1/4" quilter's foot. New, Size 80 Microtex/Sharp needles. Clover Fine Patchwork Pins. Seam Ripper and other essential quilting items. Backing fabric - 2-1/2 yards of 108" wide backing. Batting - queen size (if packaged) or a 90" x 90" piece (recommend Quilter's Dream).